Pictured are from left to right, Penny Leonard (Hannibal Coach), Alexis Stephens, Tiffany Cook, and Adrienne Shortslef. These girls helped raise the most money from Hannibal's team. On May 14, 2011, the Hannibal Varsity Girls Softball team hosted a softball double header against Corcoran at Legends Field in Oswego, NY. 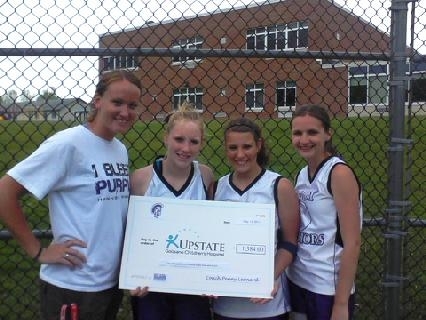 Leading up to the games, the girls on both teams asked for donations to raise money for Upstate Galisano Children’s Hospital. Combined, the teams raised a total of $1,384.00. Corcoran won the first game of the double header and Hannibal won the second game. The Hannibal Softball team would like to thank all of those who helped donate to such a great cause, and would like to thank Anthony Richmond of the More Than a Game Foundation for helping us put this event together.